According to officials, last week Iraq came to an agreement with Iran to exchange Iraqi food items for Iranian gas and energy supplies. 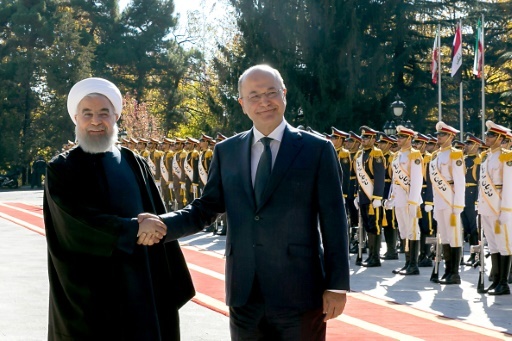 Iraq’s President Barham Salih, on Saturday, started an official visit to neighboring Iran which aims to foster positive political and economic relations between the two countries. Iran’s President Hassan Rouhani welcomed Salih and expressed openness to possible future cooperation projects. “Today, the economic relations between the two countries reach about US$12 billion [annually] and, through bilateral efforts, we can raise this figure to US$20 billion,” President Rouhani remarked in a live broadcast. The Iraqi president’s visit comes about two weeks after the United States restored sanctions that strategically target Iran’s key oil industry as well as the country’s banking and transportation sectors. “Washington has been trying to force Baghdad to distance itself from Tehran… It even gave a deadline of 45 days to Iraq to stop purchasing natural gas from Iran,” an Iranian PressTV report stated. Baghdad is currently seeking the approval of the United States to import gas for power stations. Officials commented that the 45-day waiver granted by the United States is insufficient, adding that the country needs more time to find an alternative source. Iraq imports a wide range of goods from Iran including food, agricultural products, home appliances, air conditioners and spare car parts. The goods element of Iranian imports to Iraq was about US$6 billion for the 12-month period ending March 2018, which amounts to about 15 percent of Iraq’s total imports for 2017. Featured Photo: “IRANIAN PRESIDENCY/AFP / -. Iraq’s new President Barham Salih (R) meets Iranian counterpart Hassan Rouhani on his official visit to Tehran.